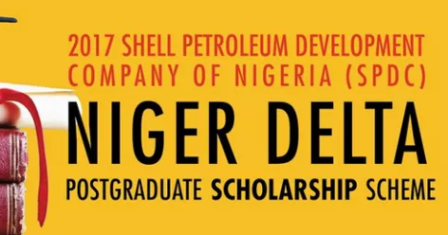 Good News: The Shell Petroleum Development Company of Nigeria (SPDC) is delighted to announce the seventh annual SPDC Niger Delta Postgraduate Scholarship Scheme for applicants from Rivers, Delta, Imo and Bayelsa States. Application Deadline: 30th January, 2017. Benefits: The scholarship will cover tuition fees, one economy return flight ticket from Nigeria to the UK and a contribution towards living expenses. Completed scholarship application forms must reach participating universities before deadline date. Visit SPDC Scholarship Webpage for more details. Now that all the information about SPDC Fully Funded Postgraduate Scholarship Scheme has been delivered nicely; talented students who are eager to pursue their Free Tuition/Scholarships/Study with SPDC for Bachelors, Masters, PhD, Associate Degree and Other Degrees, can apply now. Sponsor: Shell Petroleum Development Company (SPDC).